Rosario Pawelczak, RMT – massage Therapist registered with the Massage Therapist Association of Alberta (MTAA), the College of Massage Therapist of Ontario (CMTO) and the Canadian Sports Massage Therapist Association (CSMTA). She is the owner of Therapeutic Hands Massage Clinic in Calgary, AB. She obtained a University degree in Healthcare in 2002, as well as her massage therapy diploma in 2006 from a 2200 hour curriculum program. It is Rosario’s goal to not only heal people, but to show them the benefits of this alternative type of treatment. Rosario has been an athlete most of her life. Because of this, she learned early on, the healing benefits of massage therapy. 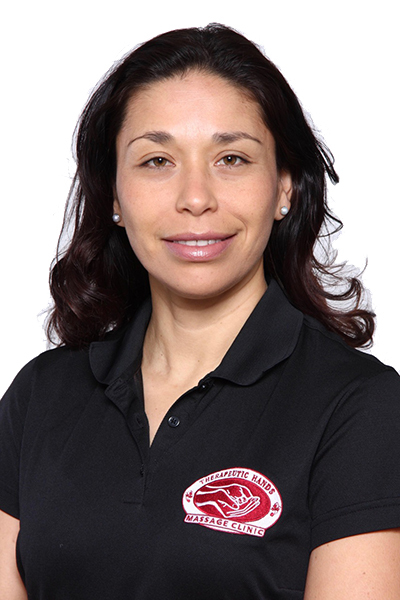 Today Rosario continues to participate in Ironman races and marathons and finds that after long training sessions and races, her body recovers much faster with Sports and Deep tissue massages. After working in various clinics for two years, Rosario opened the Therapeutic Hands Massage Clinic in 2008. Rosario knew that owning her own business would give her the flexibility to make her own schedule to take care of her two young children at home. This was a driving force for her to open Therapeutic Hands Massage Clinic, along with her desire to help others relax and with the healing process. Rosario chose the name, Therapeutic Hands Massage Clinic, in order to help people understand that the types of treatments the clinic offers, which are not only meant to relax, but also to heal. They aid in the recovery process. Types of massage therapy treatments offered at Therapeutic Hands Massage Clinic are Swedish, Deep Tissue, Sports, Lymphatic and Hot Stone. These types of treatments offered are described on Therapeutic Hands Massage Clinic’s website which helps clients to understand the procedures, the benefits of the treatments, as well as which treatment would work best for them. If the client still isn’t sure which treatment to choose, Rosario could help her clients decide which course of treatments would be most beneficial for them. Many massage therapists offer Swedish or Relaxation massages, but few combine them with a therapeutic massage, adequately deep to address each client’s needs.